As I wrote the other day, I live in Ferguson, MO. I had the time, and the inclination so on Tuesday I drove two miles east to the scene of a wrenching national drama played out through electronic and social media. For ten days now, a movement led by residents of the Canfield Green apartment complex has galvanized supporters to their side in calling for justice in the shooting death of 18-year-old Mike Brown by Darren Wilson of the Ferguson Police Department. There have been reports of mayhem at night. The authorities have shot tear gas repeatedly into residential areas. The protest has been met with an overwhelming show of force, which antagonizes the residents even more. The National Guard is here. The Attorney General for the United States, Eric Holder will visit on Wednesday. 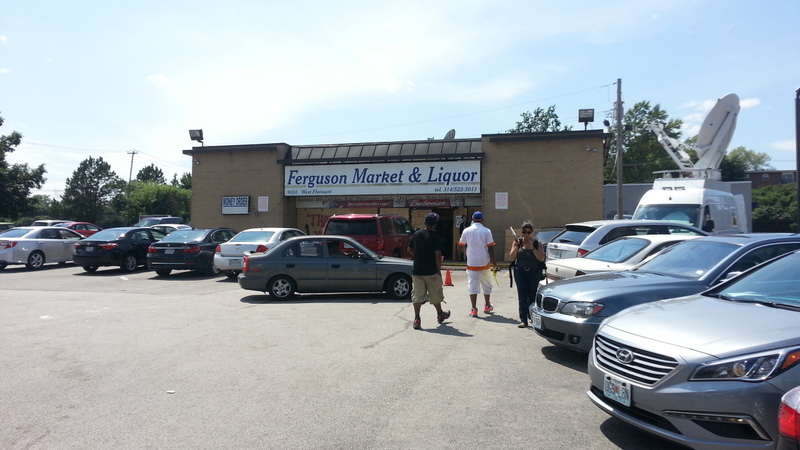 I wanted to get a handle–in person–on what’s transpiring on W. Florissant Avenue in daytime. I had to learn where exactly the standoff is going on in relation to where I live. I wanted to mind-map the terrain. I wished to connect with my neighbors. 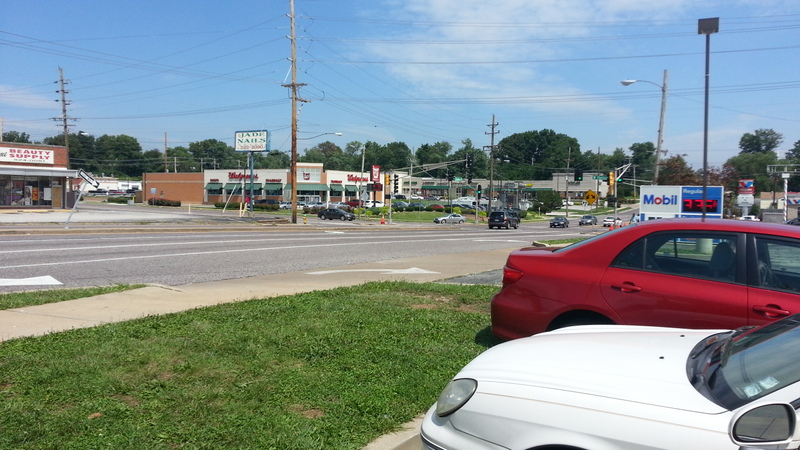 That’s the intersection of W. Florissant and Chambers Rd., seen from the southwest, looking northeast. This area was what I thought was the south end of the conflagration zone. It’s not; it is the north end. I turned right–south–on W. Florissant and noticed satellite trucks ahead, so I parked at a strip mall on the west side of the boulevard. I was struck by the wide open spaces. I was struck also by the mundane strip malls that look the same wherever you go. I had imagined close spaces from the all the photographs and video I’ve seen published. That’s probably a function of the numbers of people gathered at night. But W. Florissant is like many major suburban thoroughfares in that it is four lane and in good condition. During the day, Ferguson Market & Liquor is the media safe zone, and this is where I found Jake Tapper of CNN doing his show under a tent. About the time I left the area, the police began enforcing a “keep moving” order. I heard Mr. Tapper say to a colleague, “Let’s get moving before we get arrested.” They were packing up and moving just a few hundred yards north to stage the media safe zone at the Public Storage site. I don’t know why the media safe zone must move. There were law enforcement officers from Ferguson and the St. Louis County Police milling about at the media site. I had seen on the internet that officers had removed their badges a few days ago. There’s been a lot of speculation as to why they would do this. So I asked one; the man appeared to be the county officer in charge. He ignored me. He simply looked past me when I asked why he had no badge. That’s another CNN correspondent who was about to interview a middle-aged black woman (in foreground), on the issue of how the story is being covered. She laid out an articulate argument complaining that local TV news is sensationalizing the story with its focus on crime associated with the ongoing events. She was more sanguine about the national and international coverage of the story. This is impressionistic. I had intentions of collecting some interviews and meeting some of the independent journalists I have been following on Twitter. However, I was underwhelmed by the diffuseness of the gathering, and had trouble finding someone willing to be recorded by a guy with no media credentials. I wanted to connect with the folks braving the heat–literal and metaphorical–at the center of this story. Some further impressions: I was discouraged there weren’t more white people marching, holding signs, conversing with their neighbors. Admittedly, I’m close, and I had the time, but what I really saw were camps: black residents, white law enforcement, and those who parachuted in–national and international media. 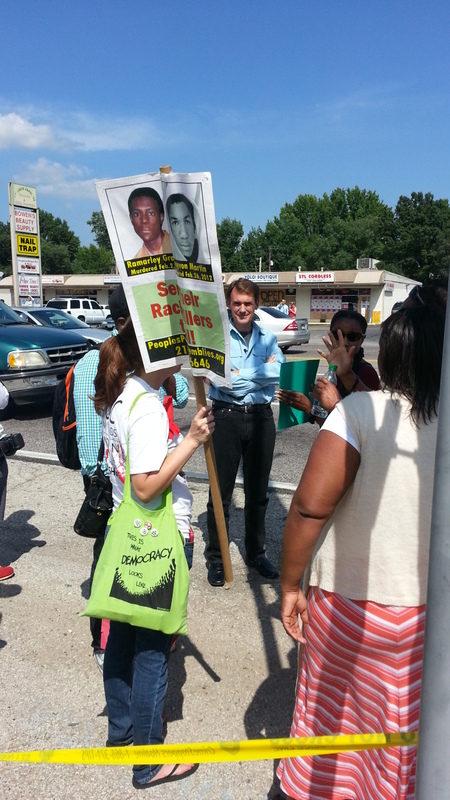 Other than professional photographers, I appeared to be the only middle-aged white guy who happened to venture down to W. Florissant and Ferguson Avenues on the 10th day of a tense, evolving story of international import. Last, I wanted to show solidarity with the people who protest. I wanted to shake some hands, and look folks in the eye. I needed to hear their stories. I did some of that. It means a lot, just to show comradeship, one young man said to me. I’ll be going back soon. This entry was posted in American History, Sociology and tagged demographics, Ferguson, media, news, protesters. Bookmark the permalink.